Studying chair conformations is likely one of the trickiest visual topics in organic chemistry, perhaps second only to Fischer projections. Not only are you required to learn a 3-dimensional concept, but you also have to manipulate that 3-D molecule on 2-dimensional paper. The average orgo student is not an artist, making this topic even trickier. In this article I’ll show you a few quick and simple tricks to help you easily draw the standard hexagon, chair conformations and ring flips for cyclohexane. When it comes to exams, you won’t be graded on how ‘pretty’ your chair looks. Instead your professor will look for clarity and the ability to distinguish your axial and equatorial substituents. 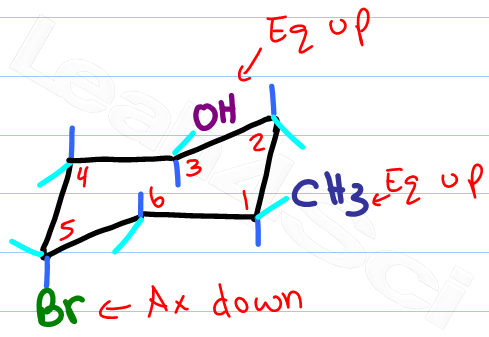 If there’s one thing you learn in organic chemistry – it’s how to draw a hexagon. Many students try to draw the entire thing at once, but the poor hexagon tends to look drunk and wobbly. As you get better you can combine steps 2 and 3 by simply visualizing the location of the dots. This is where the messiness and confusion arises. Most books will show a chair conformation slightly sideways, making it impossible to copy. Worse, it’s really difficult to show which substituents are axial vs equatorial. ‘Bowties’ as I like to call them, are ok for the computer generated chair conformation. Here is my simple version which my tutoring clients use on exams with great success. Draw 2 parallel lines slightly offset from each other. Top left or top right will give you alternate chairs. Kinda sounds like the directions for drawing a cyclohexane, doesn’t it? But the chair confirmation doesn’t stop here. It’s important to understand how to position your substituents. And even more important to show what is axial and what is equatorial. Identify the ‘up tip’ OR ‘down tip’ of your chair conformation, and draw a straight line up (up tip) or down (down tip) parallel to the y-plane. This is your first axial substituent. The chair conformation has alternating axial up, axial down… so once you have that single axial substituent move on to..
Every carbon on the chair conformation has 1 substituent axial and the other equatorial. If axial is up equatorial is down, if equatorial is up then axial is down. Pick any ONE carbon and locate its axial substituent. Draw the equatorial substituent up or down, the reverse of the axial substituent. But unlike the axial line, this one will start on the carbon and form a slight angle outward of the chair drawing. Do NOT draw these straight in the x or y plane. This is my favorite part. I find students get so confused when they try to match the cyclohexane to the drawing. All I care about matching are the numbers. Start with a blank chair conformation. 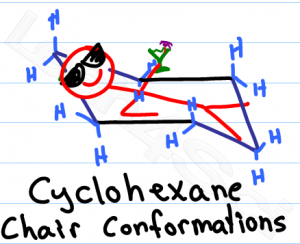 Number the carbons in your cyclohexane and in your chair. Clockwise or counterclockwise doesn’t matter, as long as you use the same direction for both molecules. Identify the carbon number for the first substituent, if it’s wedged add it to the up position. The logic and reasoning behind the chair conformation ring flip will be discussed in my upcoming chair conformations video series. (stay tuned) However, drawing the ring flip doesn’t have to be as hard as students think. Yes the flip happens when one molecule changes its conformation to another, but the key to drawing the flip successfully is to… Ignore the first chair! Counter-intuitive, I know, but trust me this method works. Once you have your first chair, determine if your parallel lines have upper right or upper left. 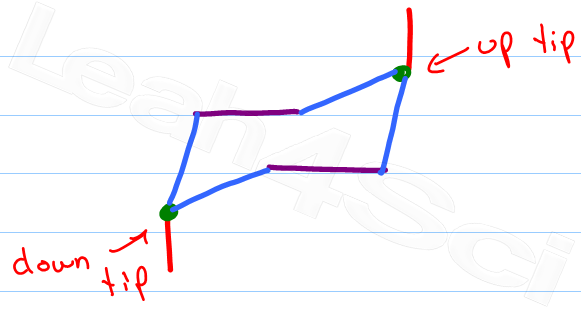 Draw another chair using the steps described above, but change the direction of your top line. If your first chair has the upper line on the right, draw the second chair with the upper line left. Ignore your first chair as you follow the rules for drawing and adding substituents. Now for the fun part, determine the new location for the up-tip carbon by ‘pulling down’ your ‘up-tip’ or raising up your ‘down-tip’ Number your new chair, and play ‘match the numbers’. If there’s a substituent up on carbon #1, it says up on carbon #1. If it’s down it stays down. The only thing that changes with your ring flip is the location of axial and equatorial. Ready to tackle some chair conformations? Learn about their structure, stability, flips and more in the Cyclohexane Chair Conformations Tutorial Video Series. After you’ve been through the tutorial, don’t forget to test your understanding with the Chair Conformations Quiz! Really helpful ma’am !!! Thank you!! Mam you are just awesome it helped me a lot thank u very much I love you mam..
for example, on the very last flipped configurational drawing, carbon #1 & #4 equatorial lines should be leaning to the opposite direction. Thanks so much, this is so helpful! I’m still having a little trouble determining which chair confirmation should be lower energy, do you have any tips on that? Thanks a lot ma’am. This was one of the confusing things in organic chemistry, but now it’s clear as crystal. 😛 You’re great ma’am. You’re welcome, Swarnavo! I’m happy to hear that! if my numbers were moving clockwise opposed to counterclockwise when i do the chair flip would my numbers all move one to the right instead? THANK YOU SO MUCH! this is the most helpful explanation of a ring flip! You just saved my organic chemistry grade. I’m a little confused about the numbering. For the upper left chair do you always number the carbon in the bottom right corner 1? Does it matter which carbon is carbon 1 as long as you keep things consistent when you do the ring flip? you are amazing!!! actual life saver thank youuuuu! I’m really sorry but I’m having trouble understanding why the numbers were moved on the last step…all the numbers in the cyclohexane seemed to move clockwise? 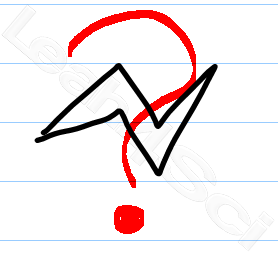 do you have a tutorial on how to draw cis and trans confirmations? This is amazinggg and so helpful! Thank you so much! Thank you thank you thank you! So helpful! It doesn’t matter Laz, so long as your consistent with your numbering in terms of clockwise or counterclockwise. YOU TRICKS APPEAR EASY, CLEAR AND LESS CONFUSING. Why on the ring flip, you started putting your “1” in a different position?